THE PLACE Hostel & Rooftop bar offers a comfortable and social experience designed to make you feel right at home! Our spacious, air-conditioned or fan dorms & rooms feature comfortable beds with lights, outlets, and privacy curtains. 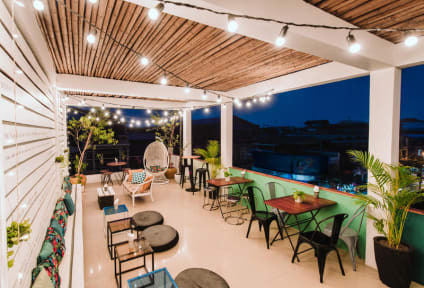 Our rooftop is a green oasis in the middle of the city and the stylish bar is a great place to drink a beer or Khmer iced coffee with your new friends from around the world! We are situated in the city center featuring numerous shops, restaurants, art galleries and famous attractions. The central market is 1 minutes walking, the riverside 2 minutes, and the art quarter 3 minutes! Discover the countryside, and the famous places around Battambang by joining the Full day tour with our other guests! Enjoy a guided tour through the city center and discover the history and the famous colonial architecture of Battambang. Visiting a foreign country can be a life-changing odyssey for most, with many memories and friendships made. We believe that traveling to different parts of the world, experiencing different cultures, and embracing the local traditions is the best way to immerse oneself in the pleasures of globetrotting. I have never experienced such attentive and helpful staff at a hostel before. We came during the Cambodian New Year and were trying to get a Tuk Tuk to take us around to the different tourist attractions and one of the hostel employees drove his bike around asking over 20 drivers if anyone would take us until he found someone that would. Clean rooms, good food, wonderful staff, this was one of the best hostel experiences I’ve had. Excellent stay. Clean and comfortable rooms and social space which is done well to easily meet people and to have your own space. Spacious double bed bunks with curtains. Very friendly and helpful staff who spoke very good English - one member called our bus company when we'd been waiting a long time. Affordable menu with a very good tasting breakfast ($2 pancake and banana, $0.5 2 pieces of toast). Thoroughly recommend! Pros: Fabulous location, most of the staff were really nice, good size of lockers and I really liked the comfortable hangout areas. Cons: The privacy curtains on my room didn't pull shut, the central location means that it's very light and noisy from early in the morning. Also when I came to check-in I was left 40 minutes before anyone came to reception. Food upstairs ok but very slow at times; I waited 30 minutes for French fries (but it was kind of a weird time of day). Great place to stay, awesome location next to the night market! The rooftop bar is great to relax after a day of sightseeing&the food they serve is very tasty. Showers, especially the little shelves to put your toiletries on could have used a little extra cleaning as these were sticky from old soap. & there were dust bunnies under the beds. Also, they don't lock the doors to the dorm saying that is difficult with many guests staying, but than they also let Non guests go to the rooftop. The staff here are really friendly and great to chat with. 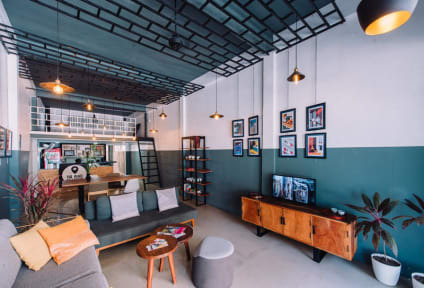 There was a bit of a lack of atmosphere in the hostel itself, but that's mainly due to the fact that not a lot of backpackers come through Battambang and tend to head straight to Siem Reap. Minus a couple of points due to an issue with my bed (remedied very quickly by staff) and the fact that a couple of items went missing in the laundry (easily replaceable). Overall, a nice hostel run by a great team. Clean hostel with nice facilities, but there where no atmosphere. I got my laundry back later than what they told me (because of no power during the day), and when I got it back it was still wet. Not the best AC in the room. Good value, but not our best hostel stay. The room smells HORRIBLE, like they had just relaqured all the wood? Very, very strong smell of paint or chemicals or something. The toilets smells awful and the shower smelled like onions? My bed was also not cleaned when I checked in, but the very friendly and helpful staff did come in and clean in right away. The rooftop bar was pleasant, and the location is very central, but it's a pretty grimy place.